Reportedly, some scam accounts uploaded thousands of duplicate images, while others wrote reviews, answered questions, to pose themselves as legitimate business persons. 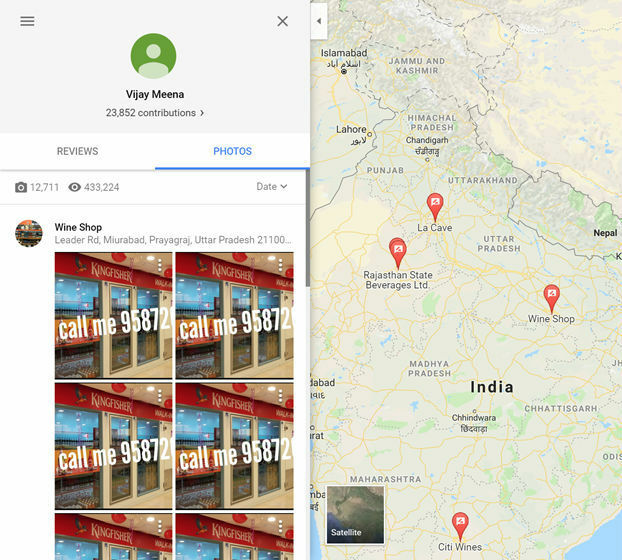 Scammers in India are using Google Maps to dupe people. Posing themselves as legit businesses, they promise to deliver booze in exchange of an advanced payment. 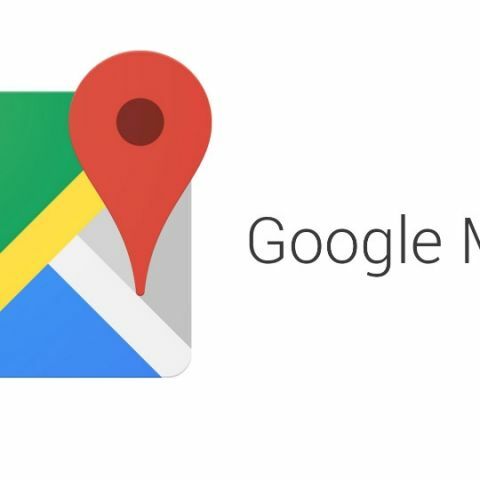 Google has been working hard in developing Maps as a standalone app that can provide users with a platform for ease of commuting and communication. However, it has been found that people are taking negative advantage of the company’s service. In yet another incident of exploitation of Google Maps, it has been reported that scammers in India are using the service to mint money by offering an option to deliver alcohol at people’s doorsteps. The information about this whole operation was busted by a Twitter user @DrunkenPandaman, who claimed that thousands of images posted on Google Maps have the same phone number on them. According to Android Police, when contacted on this number, the person (or a group of people) on the other side would promise to make home delivery of alcohol in exchange for an advance payment. But how does this scam run? When a person contacts the scammer on the provided phone number, he/she sends a list of available alcohol along with prices. Once selected, the the scammer asks for an advance payment via either Paytm or by sharing card details. The scam seems to be flourishing because apparently authorised and licensed businesses are flashing messages warning buyers to beware of scammers. There are two possible reasons that could be helping these types of scams to flourish. First is the lack of understanding of technology. Several reports have mentioned that a lot of people in India are first time users of the internet on smartphones and they do not have the complete understanding of such scams that can dupe them. Scammers usually wait for such victims, and unfortunately, these gullible users are available in abundance in the country. The second reason could be the inability of Google’s systems to catch these scammers. Google has been pushing artificial intelligence and machine learning in its systems to make them more efficient. 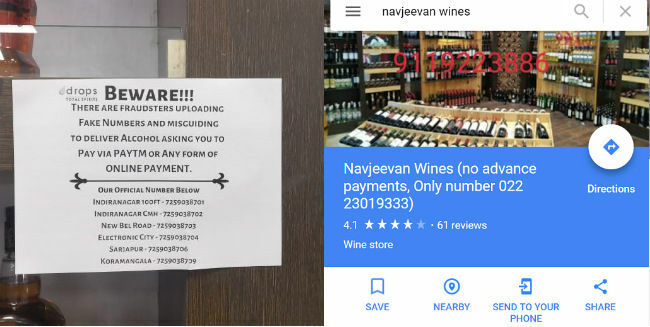 It can be argued that Google’s algorithms could have caught those behind such booze scams because of the dissemination of the same number in thousands of images. 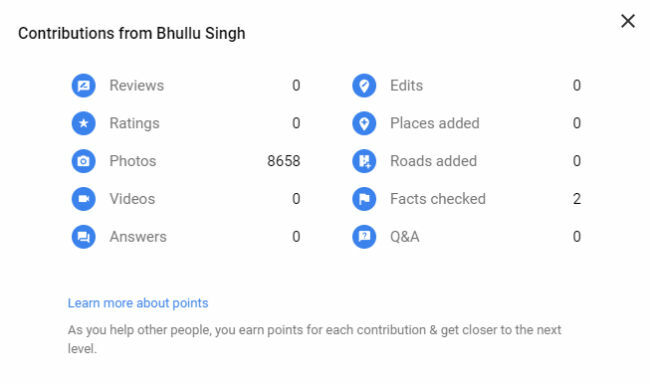 With just a bit of research, we stumbled upon a tweet that had a link to a user who has contributed over 8000 images and literally zero reviews, ratings, videos or answers. Google has provided a response saying that they are always working to develop better ways to check the negative intent of scammers. “Spammers and others with negative intent are a problem for consumers, businesses and technology companies that provide local business information. We’re always working on new and better ways to fight these issues and keep our information up to date,” Google was quoted as saying. “We use automated and manual systems to detect for spam and fraud, but we tend not to share details behind our processes so as not to tip off spammers or others with bad intent. We take allegations of fraud very seriously. When an issue like this one is reported to us, we investigate the claims. Upon completion of the investigation, we take actions in line with our findings,” the company added.